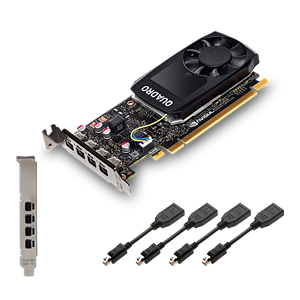 Modern Quadro graphics cards are designed to work with the latest and most advanced monitors utilizing the DisplayPort standard. 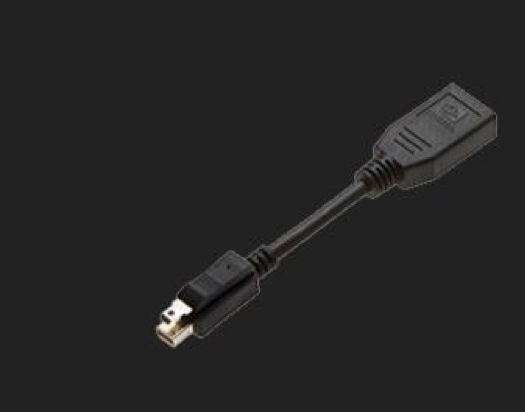 Full-size DisplayPort connectors provide not only the bandwidth required to drive professional monitors at incredible resolutions such as 4K, 5K and even 8K, they have cable retention features like a friction lock and a mechanical latch. However, it is physically impossible to deploy more than two full-size DisplayPort connectors on low-profile graphics cards such as P400, P600, P620 and P1000 while maintaining the maximum number of video outputs the GPU can offer, so Mini-DisplayPort is utilized by these Low-Profile cards. While Mini-DP (also known as mDP) maintains the same bandwidth as its full-size counterpart, it does lack physical security features due to its small size. This is where NVDIA worked with PNY to develop NVIDIA certified Mini-DP to DP adapters that we include with applicable Quadro and NVS graphics card products. These adapters have an additional security clip as part of their industrial design that works specifically with NVIDA’s Quadro and NVS low-profile cards. These adapters received NVIDIA certification by collaborative engineering and lab-testing to maintain the bandwidth necessary to deliver an ideal end-user experience. We highly recommend you insist on deploying your low-profile boards with NVIDIA certified adapters over third party adapters, since NVIDIA certified and PNY sourced adapters are designed to work specifically with NVIDIA Quadro and NVS professional graphics cards. Inferior adapters could potentially cause signal loss and drop in bandwidth that prevent the GPU from outputing at its maximum resolution, refresh rate or color depth that professional across disciplines ranging from AEC or M&E to DCC need to stay productive and creative.